The Regiment was raised by Colonel John Gibson in 1694 at Portsmouth, and following the tradition of the time was named 'Gibson's Regiment of Foot' after the Colonel. In 1697 The Regiment sailed to Newfoundland to protect British settlers from the French but arrived too late, and found the colony destroyed and most of the settlers killed. It then went on to serve during The War of Spanish Succession (1701–1714). In 1751 the Regimental naming system was simplified with each Regiment assigned a ranked number therefore, becoming the 28th Regiment of Foot. The Regiment went on to serve in The Battle of Fontenoy (1745), during the War of the Austrian Succession (1740–48). In 1757 the 28th sailed to Canada during the Seven Years' War to capture the Louisburg fortress in Nova Scotia and then on to attack Quebec. They also served at the Battles of White Plains, Brandywine and Germantown during the American war of Independence (1775–1783). In 1782 all British Regiments without Royal titles were awarded county titles in order to aid recruitment and the 28th became the 28th (North Gloucestershire) Regiment of Foot. It went on to serve during The French Revolutionary War (1792–1802) and fought at the Battle of Alexandria in 1801. At this battle they gained the unique honour of wearing a badge on both the front and back of their head dress, due to the unique action of the infantry when they simultaneously repelled French attacks from the front and the rear. The 28th also served throughout the Peninsula War (1808-1814) including the Battles of Talavera, Albuhera and Vittoria as well as the Hundred Days campaign, the battles of Quatre Bras and Waterloo. In 1881 The 28th merged with the 61st (South Gloucestershire) Regiment of Foot as part of the Childers Reform, to form the Gloucestershire Regiment. The Childers Reforms restructured the British army infantry Regiments into a network of multi-battalion Regiments each having two regular and two militia battalions. The 61st Regiment of Foot was formed in 1757 when the 2nd battalion of the 3rd Regiment of Foot (later The Buffs) became independent. The Regiment went on to serve in the West Indies capturing Guadeloupe from the French during Seven Years' War (1754–1763). The 61st were garrisoned on Minorca from 1771 at the outbreak of the American war of Independence (1775–1783), subsequently the 61st found itself besieged and forced to surrender at Fort St Philip to a Franco-Spanish force, due to insufficient men after dysentery struck the garrison. The Regiment was awarded a county title in 1782 and became the 61st (South Gloucestershire) Regiment of Foot. The 61st also served in West Indies from 1794-1796 during French Revolutionary War, attempting to capture of Martinique and St. Lucia from the French. In 1801 it was deployed to Egypt to expel the French and then moved to Italy but was forced to evacuate to Sicily with the deposed King Frederick IV fighting at Battle of Maida. In 1809 it took part in the Peninsular War fighting at the Battles of Talavera, Salamanca, the Siege of Burgos, the Battle of the Pyrenees, Nivelle, Nive, Orthez, and the Battle of Toulouse. It was then on garrison duty for over 30 years in Jamaica, England and Ceylon (now Sri Lanka) before moving to India in 1845 and fighting during the Second Anglo-Sikh War (1848-49) at the Battles of Ramnagar, Saddalupar and Chillianwala and Gujrat. It remained there until 1859 and took part in the Indian Rebellion of 1857 fighting at the Siege of Delhi. 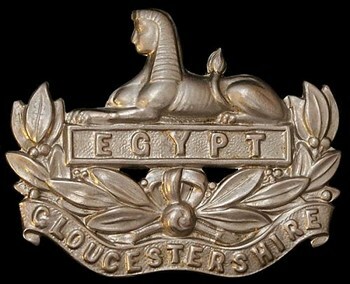 The newly formed Gloucestershire Regiment went on to serve in the Second Boer War (1899 to 1902) and two World Wars. In 1994 as part of the British Army’s ‘Options for Change’ reforms, The Regiment was merged with the Duke of Edinburgh's Royal Regiment to form The Royal Gloucestershire, Berkshire and Wiltshire Regiment. Further amalgamations accrued in 2005 when this Regiment merged with the Light Infantry, The Royal Green Jackets and the Devonshire and Dorset Regiment to form The Rifles. The Regiment raised a total of 25 battalions and was awarded 72 Battle Honours, 4 Victoria Crosses and lost 8,100 men during the course of the war. 11.11.1918 Ended the war in France, Fresnoy-le-Grand. 04.08.1914 Stationed at Tientsin, China at the outbreak of war. Set sail for the UK. 08.11.1914 Landed in Southampton then moved to Winchester and joined the 81st Brigade of the 27th Division. Nov 1915 Moved to Salonika landing by 12.12.1915 and engaged in various actions against the Bulgarian Army including; The capture of Karajakois and Yenikoi, the battle of Tumbitza Farm. The final offensive in Salonika, The capture of the Roche Noir Salient, The passage of the Vardar River and pursuit to the Strumica valley. 04.08.1914 Stationed at Bristol and then moved to Abbey Wood, Woolwich. May 1915 Moved to Gravesend and on to Sittingbourne where it remained until the end of the war. 04.08.1914 Both stationed at Bristol as part of the Gloucester and Worcester Brigade of the South Midland Division. Aug 1916 Moved to Swindon and then on to Essex. Nov 1917 Moved to Italy to strengthen the resistance and engaged in various actions including; The fighting on the Asiago Plateau and The Battle of the Vittoria Veneto. 04.11.1918 The 1/4th ended the war in Austria, Baselge de Pine N.E. of Trent and the 1/6th ended the war Cire, east of Trent. 04.08.1914 Stationed at Gloucester as part of the Gloucester and Worcester Brigade of the South Midland Division. Aug 1914 Moved to the war station on the Isle of Wight and then moved to Swindon and then on to Chelmsford. Nov 1917 Moved to Italy to strengthen the resistance and engaged in various actions including; The fighting on the Asiago Plateau. The Battle of Cambrai 1918, The Pursuit to and Battle of the Selle, The Battle of the Sambre. 11.11.1918 Ended the war in France, Preux north of Landrecies. Sept 1914 Both formed in Bristol and then moved to Northampton to join the 183rd Brigade of the 61st Division. April 1915 Moved to Chelmsford. Feb 1916 Moved to Salisbury Plain. The Operations on the Ancre, The German Retreat to the Hindenburg Line, The Battle of Langemarck, The Cambrai Operations. Sept 1914 Formed in Gloucester and then moved to Northampton to join the 184th Brigade of the 61st Division. Feb 1916 Moved to Tidworth. 11.11.1918 Ended the war in France, Maresches south of Valenciennes. 1915 All formed and wintered at Weston-super-Mare. 08.04.1916 Became the 4th 5th and 6th Reserve Battalions as part of the South Midlands Reserve Brigade Territorial Force and moved to Cheltenham. Mar 1917 Moved to Catterick and then Horton, Northumberland. Oct 1917 Moved to Seaton Delaval. Aug 1914 Formed at Bristol as part of the First New Army (K1) and joined the 39th Brigade of the 13th Division and then moved to Tidworth. Jan 1915 Moved to Basingstoke and then on to Blackdown, Aldershot. Jun 1915 Mobilised for war and embarked at Avonmouth for Gallipoli. July 1915 Landed at Gallipoli and engaged in various actions including; The Battle of Sari Bair, The Battle of Russell's Top, The Battle of Hill 60. Jan 1916 Evacuated to Egypt due to heavy losses from combat, disease and severe weather and defended the Suez Canal. The Battle of Kut al Amara, The capture of the Hai Salient, The capture of Dahra Bend, The passage of the Diyala, capture of Bagdad, The Second and Third Actions of Jabal Hamrin and Tuz Khurmatli. July 1918 Transferred to the 39th Brigade of the North Persian Force. 31.10.1918 Ended the war in North Persia, Bijar. Sept 1914 Formed at Bristol as part of the Second New Army (K2) and joined the 57th Brigade of the 19th Division and then moved to Perham Down. The Battle of Messines, The Battle of the Menin Road Ridge, The Battle of Polygon Wood, The Battle of Broodseinde, The Battle of Poelcapelle, The First and Second Battles of Passchendaele. Sept 1914 Formed at Bristol as part of the Third New Army (K3) and joined the 78th Brigade of the 26th Division and then moved to Cheltenham. April 1915 Moved to Longbridge Deverill. 21.09.1915 Mobilised for war and landed in France. 04.07.1918 Left the 26th Division and returned to France arriving at Serqueux 17.07.1918 and joined the 198th Brigade of the 66th Division. 11.11.1918 Ended the war in France, east of Avesnes. Sept 1914 Formed at Bristol as part of the Third New Army (K3) and joined the 26th Division and then moved to Salisbury Plain. Nov 1914 Moved to Cheltenham and then back to Salisbury Plain April 1915. 14.02.1918 Disbanded in France and personnel transferred to the 13th Entrenching Battalion. Oct 1914 Formed as a service battalion of the Fourth New Army (K4) at Abbey Wood, Woolwich and joined the 106th Brigade of the 35th Division. Nov 1914 Moved to Cheltenham. 10.04.1915 Became the 2nd Reserve Battalion and then moved to Belhus Park, Essex. Sept 1915 Moved to Seaforth as part of the 4th Reserve Brigade. 01.09.1916 Became the 16th Training Reserve Battalion of the 4th Reserve brigade. 30.08.1914 Formed by the Citizens’ Recruiting Committee in Bristol. June 1915 Moved to Wensley Dale to join the 95th Brigade of the 32nd Division. 23.06.1915 Taken over by the war office and moved to Salisbury Plain. 21.11.1915 Mobilised for war and landed in France. The Battle of Vimy, The Attack on La Coulotte, The Battle of Polygon Wood, The Battle of Broodseinde, The Battle of Poelcapelle, The Second Battle of Passchendaele. The Battle of Hazebrouck, The Battle of Albert, The Battle of Bapaume, The Battle of Drocourt-Queant, The Battle of the Epehy, The Battle of the Canal du Nord. Dec 1914 Formed at Malvern by Lieutenant Colonel H Webb, MP. 12.07.1915 Taken over by the War Office and moved to Winchester as a Pioneer Battalion of the 39th Division. The Battle of St Quentin, The actions at the Somme crossings, The Battle of Bapaume, The Battle of Rosieres, The fighting on Wytschaete Ridge, The First and Second Battles of Kemmel, The Battle of the Scherpenberg. 06.05.1918 Reduced to training cadre and transferred to the 66th Division. 20.09.1918 Defending the Lines of Communication in the 197th Brigade. 11.11.1918 Ended the war in France, near Aumale. 22.04.1915 Formed as a bantam battalion by the Citizens’ Recruiting Committee in Bristol. June 1915 Moved to Masham, Yorkshire as part of the 105th Brigade of the 35th Division. 23.06.1915 Taken over by the War Office and then moved to Salisbury Plain. 11.02.1918 Disbanded in France 12 Officers and 250 men transferred to the 13th Battalion. Aug 1915 Formed at Sutton Coldfield as a local reserve battalion, from the depot companies of the 12th and 14th battalions and then moved to Chisledon as part of the 22nd Reserve Brigade. 01.09.1916 Became the 93rd Training Reserve Battalion. Nov 1915 Formed at Chisledon as a local reserve battalion, from the depot company of the 13th battalion as part of the 22nd Reserve Brigade. 01.09.1916 Became the 94th Training Reserve Battalion. 01.01.1917 Formed at Walton-on-the-Naze from the 82nd provisional Battalion as part of the 226th Brigade. Mar 1917 Moved to Clacton where it remained until the end of the war. 20.06.1918 Formed at Clacton from the 5th Oxford &Bucks Light Infantry cadre, then moved to Aldershot to join the 49th brigade of the 16th Division. 01.08.1918 Mobilised for war and landed in France and engaged in various actions on the Western Front including; The Final Advance in Artois. 08 May 1940: The Battalion was involved in the Battle of France after Germany's invasion of the Low Countries. It took part in the defensive screen protecting the Dunkirk evacuation. 06 June 1944: It took part in the D-Day landings. September 1944: It was involved in the North-West Europe campaign. 1945-1946: Were part of the 56th Infantry Brigade. 1939: The Battalion was part of the 144th Infantry Brigade, 48th (South Midland) Divison. 31st May 1940: Evacuated from Beaches of Dunkirk. Once returned to the UK, they were taken to Kington, Herefordshire. 14 January 1941: Became part of the 43rd Reconnaissance Regt. 1940: The Battalion was formed. April 1942: Converted to 159 Royal Armoured Corps Regiment. December 1942: Arrived in India and joined 32nd Indian Armoured Division. March 1943: Serving in Burma. It was converted back to 10th Battalion (Infantry)and became part of the 72nd Brigade, attached to 36th Division, led by Major General F.W. Festing. (Also known to the troops as "Front Line Frankie") Formation sign of 36th Division were two interlocking circles, one Red and one White and were worn on the uniforms. April 1944: 'C' Company of the 10th Battalion had taken a Japanese officer sword during 'Ham Bone', action in Burma. 22 November 1944: The Battalion began its assault at Pinwe after the Artillerys bombardment, a long with an air attack on the enemy. It was an extremely fierce fight. 26 November 1944: They were relieved. Pinwe fell two days later. January 1945: They crossed the Irrawaddy River and came under the command of the Fourteenth Army. They were involved yet again in extremely fierce fighting that led to the final operation that broke the last Japanese resistance in Burma.